SS17 runways are crammed with tarot and zodiac inspired pieces. The best news? You can get ahead of this trend now as there are loads of horoscope themed items available on the highstreet. Topshop and Wildfox have amazing PJs’ and Zara have the cutest clutch bags. Wear your sign with pride! I for one haven’t been this into my star sign (Taurus btw) since I was a 13 year old “tweeny bopper” and I lived for the horoscope section in Cosmopolitan Magazine. I sought great comfort, over analysing the ridiculously open statements and interpreting them to mean whatever my subconscious wanted them to mean at that given time (yes, I am 100% a horoscope sceptic). These items are all available now: Links of London Virgo Charm £55, Pisces silk eye mask by Yolke at Selfridges £39.50, Star Print flippy dress from Warehouse £49, Horoscope shirt Yves Saint Laurent at Farfetch £630, Scorpio Charm by Annoushka at Harrods £550, Carolina Bucci Ring (18k Rose Gold) £2,750, Taurus Zodiac Sticker by Anya Hindmarch £45, Libra charm by DVF £44, Leather pouch DVF £61, Applique patch DVF £22 (Shown on bag). 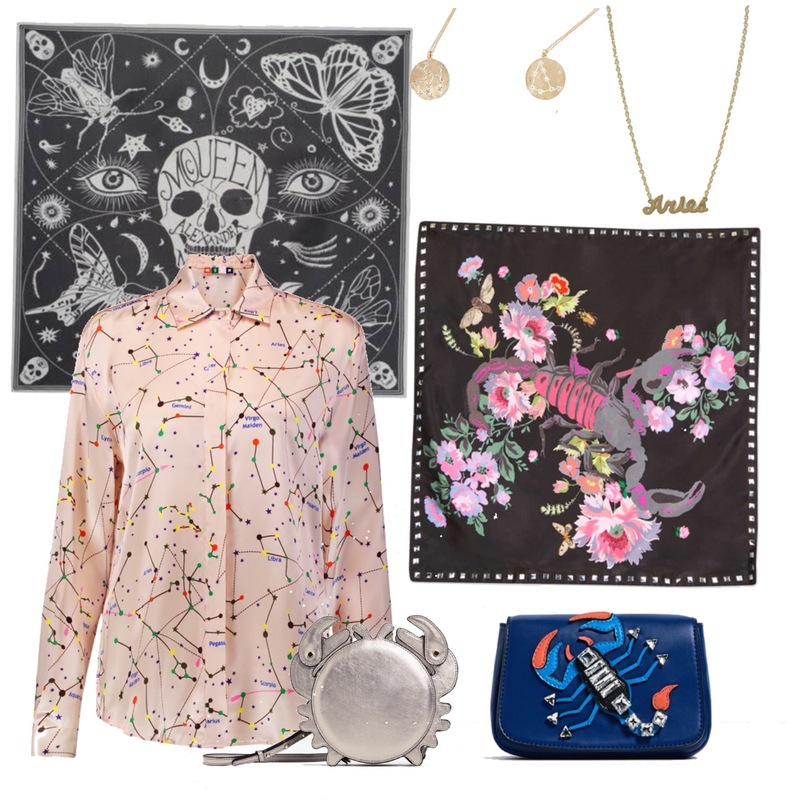 All this available now: Scorpio stud necktie TOPSHOP £12, Zodiac Skull Scarf Alexander McQueen £245, Diamond zodiac charm by Brooke Gregson at Net-a-porter £1350, Satin Zodiac constellation shirt by MSGM from theoutnet.com £182.26 (sale), crab cross body bag- Zara £29.99, Scorpio bag-also Zara £29.99. What about dressing for your Star Sign? So, having looked at the budding trend of Zodiac inspired fashion I have become curious. Never satisfied to just sit and ponder, I got researching. Is there any merit to dressing for your sign? What are the Style Rules for each sign? I like scarves and expensive things (what a shock!). All this because I am “ruled by my throat” (PMSL) and as a result I am told that taureans are obsessed with decorating their necks and stuffing their faces! Although I laugh, I really am drawn to oversized scarfs and statement necklaces. So, maybe, just maybe, there is something in it. Then again, I’m also drawn to shoes, handbags, leopard print, coats (you can never have enough, they are the last thing you put on but the first thing people see you know! ), glitter, sunlight, the ocean, the smell of bacon (despite being vegetarian)…the list is pretty endless, can it all be blamed on the bull? My conclusion…. Yes! Let’s blame my “hanger” and inability to back down on the position of the stars at my time of birth. In the edits below, I have selected a style crush of my own that represents each star sign. I have annotated each image with some simple style rules/advice related to that specific sign and because I am super good to you guys I have also selected a “star buy” item for each sign (in accordance with the aforementioned “rules”). Kate Bosworth always looks office-ready chic. (this floral top is bang n trend and if you want to see other similar items head over to my other post Floral Print for Winter? Christina, playing up her neckline with detailing like a true Taurean. Blake is always on trend and put together. In boycotting make-up recently, Alicia has shown what a true rule-breaking, trendsetter she really is. What an absolute babe! Often in conflicting pieces that somehow “work” these style queens are typical Gemini. Taylor has come a long way from the Gossip Girl days. Sagittarians- purple, royal blue, indigo. Scarlett Johansson experimental. unique one of a kind ppieces. versatile. Rihanna is the ultimate Pisces- Wearing girly and romantic clothes, always with and artsy twist. Think “Evolutionary Style” think Solange Knowles- This Cancerian has been on such a style journey. My favourite Fashion Police panellist…how could I not feature Kelly Osborne in this line-up? So, that concludes my weekly fashion musings. Does your star sign influence your style? well, I think you can find some truth in most things, if you look hard enough. Do these star buys reflect your personal style? Do the style traits listed with your sign ring true? Or does the whole lot strike you as total baloney? Id love to hear your thoughts. * feature image is from Gucci SS17 and shows their Crab bag. i love black lively style ! so chic !